We may not see Haiti in our news every day, but the needs of Haitian families are still overwhelming. The effects of disaster, disease, illiteracy and Voodoo are crippling. Many are without hope, but there’s a spiritual openness like never before. This is a time of opportunity; a time for sustainable solutions. With the power to reach a wide audience for years to come, Resounding Hope is positioned to impact Haiti like never before, one solar radio at a time. 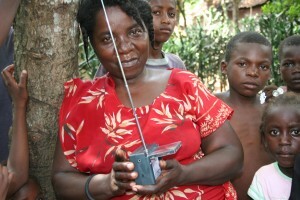 160,000 solar radios tuned to Christian radio station, Radio 4VEH, given out with a face-to-face Gospel witness. 1,000,000 new listeners with daily access to Scripture reading, Bible teaching, life-saving information, farming and health advice, and other life skills. The Gospel in Haiti, amplified. In the past, thousands of solar radios tuned to Radio 4VEH brought new life to many communities across Haiti. The broadcasting transforms lives as listeners hear the Gospel, come to Christ and start new churches to share hope. Today, Resounding Hope aims to provide this daily lifeline to an estimated one million people in Haiti. A crucial part of our strategy involves equipping Haitians to do the majority of radio distribution. This combination of face-to-face Gospel presentation, the solar radio and the immediate and longer-term broadcasting of Radio 4VEH is the most effective way to reach people, even in remote areas. We envision a constantly increasing number of Haitians maturing in their faith, taking active roles in their churches and communities, with a missionary vision wherever they are.